Mobile devices such as smartphones and tablets have changed the way people work and live by providing instant, anytime, anywhere access to information. Given the highly mobile life of a surgeon, smartphones have become a lifeline for case-related communication. Regardless of whether a surgeon is outside of a hospital environment or within different hospital settings (i.e. pre-op, recovery, intensive care, etc.) they need a way to stay connected when access to a traditional computer is not possible. For many, that connection is their smartphone. 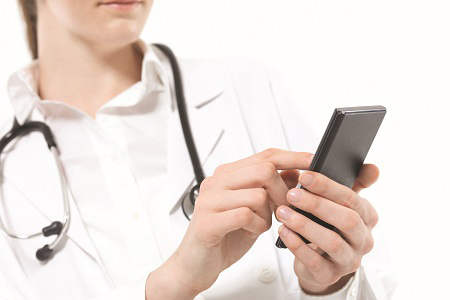 A report by Kantar Media cites 84 percent of doctors use smartphones on the job. But just how reliable is the information surgeons are accessing from their mobile device? iPhones and Android devices are regularly used by Surgeons, anesthesiologists and medical reps to check schedules, look up or share lab results and X-rays, and to get context critical for a surgical procedure. Unfortunately, not all of the information they access is current. As a result, case delays and cancellations are quick to follow and OR efficiency is lost. Schedules change. Case documents are added and updated. Medical devices are substituted. But because hospitals operate in a silo, real-time changes and updates are not always accessible to those outside of a hospital’s network and/or when relying on a mobile device. In most hospital environments key stakeholders (schedulers, surgeons, anesthesiologists, medical reps, etc.) work in their own system, with their own scheduling software. When operating in a silo, there is no one place to view all case-related information. This means surgeons, anesthesiologists, medical reps, etc. must rely on schedulers and office staff to alert them to changes either via text, phone call or email. And, while there is the assumption that because this information was sent it was received, this isn’t always the case. Providing complete case communication to those who need it and a holistic view of a case at each step of the way is essential to keeping OR cases on track. This requires breaking down the silos. To do so hospitals must implement a surgery coordination hub that gives stakeholders one central place where they can look at and share all case-related information. A cloud-based system enables real-time access through a tablet, iPhone or Android device so everyone is on the same page regardless of their location. Proactive updates that alert case members each time a change or update is made and red flags ensure nothing is overlooked. There are also many residual benefits that can be achieved by deploying a surgery coordination hub. Following are just three examples. Ensures vendors aren’t overlooked. Surgery coordination technology makes it easier to manage medical device vendors. Providing real-time access to case information from their mobile device greatly reduces the likelihood of a vendor bringing the wrong device or arriving at the wrong time. Improves surgeon satisfaction. Providing an easy-to-use, HIPAA-compliant way for surgeons to stay connected greatly improves the physician experience. Real-time access to case information from a mobile device also allows surgeons to see whether a case is running on-time which provides them greater control over their schedules. The ability to upload case information to a central hub eliminates the need for multiple calls, texts and fax. All the information is one place for everyone to see. Improves OR efficiency. ORs are typically the largest revenue-generating areas within a hospital. Because they are resource-intensive, they are also one of the highest cost centers. Therefore, it should come as no surprise that OR efficiency plays a key role in a hospital’s financial performance. Eliminating scheduling errors and miscommunication, key contributors to OR delays and cancellations, will greatly improve OR efficiency. Coordinating a surgery is a complex task. It involves many intricate details and multiple people. To ensure everyone is continually on the same page requires a surgery coordination hub. Enabling surgeons, anesthesiologists and other key stakeholders to access and share all case information from within this hub via their mobile device ensures everyone is on the same page. Streamlined communication eliminates day-of-surgery surprises which creates a more efficient OR schedule. Mark Mele is Vice President of Sales at Casetabs, the pioneer of cloud-based surgery coordination technology. He has 15 years of sales and marketing experience in medical devices, working for ConMed, Biomet, and NuVasive. Mark is experienced in building start-up territories and managing teams and product lines with over $100 Million dollars in annual revenue. He is a graduate of the University of Illinois at Urbana-Champaign.